Writer’s Block Bookstore, in partnership with Quantum Leap Winery, is proud to announce YouTube health and wellness superstars “Fit Couple Cooks” (comprising husband and wife duo Stephanie Tornatore and Adam Bannon) as the third speakers in our series of book talks, ine ◊ Wisdom ◊ Words on May 23rd, at 6:30PM. A discussion and signing will round out the evening! About the book: Achieve your diet goals, maximize your time, and save money with meal plans and recipes. Planning ahead is the best way to ensure success when you’re trying to eat healthy, but figuring out what to make and eat each week can be overwhelming. Healthy Meal Prep is the first full-color cookbook devoted to meal prep strategy with 12 weekly meal plans, each with 4 unique recipes for 6 days of breakfasts, lunches and dinners. Each week includes step-by-step guidance on how to execute your meal prep, including time-saving shortcuts, simple strategies for making meal prep work for your diet, budget, and lifestyle, and complete nutritional information for every recipe to help manage diet goals. Healthy Meal Prep does the work for you with meal plans and recipes that guide you through preparing a week’s worth of wholesome, balanced meals in just a few hours. About the authors: “Fit Couple Cooks” is the creation of fitness enthusiasts Stephanie and Adam who are passionate about clean eating and maintaining a well-balanced, healthy lifestyle. Their channel is packed with videos of delicious, easy-to-follow recipes, and occasional daily vlogs, which gives their viewers a glimpse of their personal life. 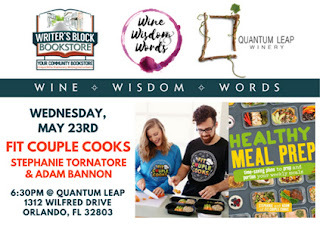 About the Wine ◊ Wisdom ◊ Words series: Writer’s Block Bookstore, in partnership with Quantum Leap Winery, brings you a new speaker series highlighting bestselling authors paired with unique, sustainable wines. Our inaugural spring season features a new literary luminary each month from March to May. About Quantum Leap Winery: Quantum Leap is a local winery with a global reach and sustainable focus, and the only sustainable winery in Orlando. Committed to bringing quality, environmentally-friendly wines at a great value to the community. Quantum Leap is open for tastings, tours, and retail wine purchases Tuesday to Saturday, from 12 to 8PM—and is also a great venue for private events! 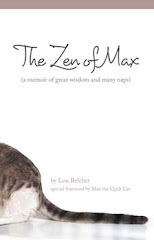 About Writer's Block Bookstore: We are Central Florida’s local, full-service, independent community bookstore, in beautiful downtown Winter Park. Serving the Orlando area since 2014, we have all your favorites, New York Times best-sellers, and Indie Next picks. We host author events, monthly book clubs, coordinate author school visits and offer discounts for educators and loyalty club members.